No Time For Figleaves, 1999. Back row – Caroline Pinder, Julie Bailey, Alison Robson, Bob Hawkes. Middle row – Sally Cartledge, Sarah Summers, Christine Stepney, Stuart Summers, and Anne Monk with Nicola Bailey and Catherine Wall in front. A scene from Scrooge 1901. 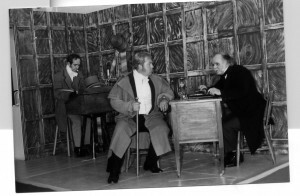 – Scrooge office, with L to R. Chris Poole as Bob Cratchet, David Stepney as Scrooge’s nephew, Fred, and Chris Dracott as Scrooge. 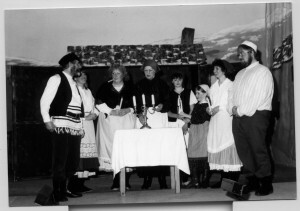 A scene from Fiddler on The Roof 1986. 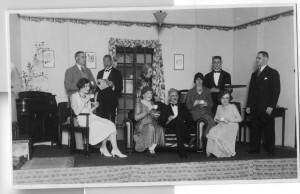 L to R. Tony Grosse as Tevye, Paulette Daniels, Janet Elworthy, Polly Eden as Tevyes wife, Golde, Faye Patten, Rebekah Bawler, Anne Rochel, and David Stepney. The Hemyock History Group meet on the second Thursday of the month with speakers talking about interesting historical subjects. The meetings start at 19:30 in the church rooms. For more information please send us an email on the Contact Us tab.